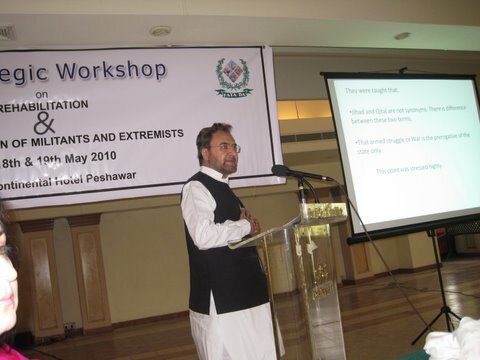 Dr. Farooq Khan presenting a paper at the 1st Strategic Workshop on Rehabilitation and De-Radicalization of Militants and Extremists organized by the FATA Secretariat and ICPVTR /RSIS on 18-19 May 2010, Peshawar , Pakistan. The Vice-Chancellor of the Islamic university of Swat, Dr. Farooq Khan was assassinated by the Taliban on the 2nd of October 2010. Dr Khan was born in a village in Swabi district of KP. He got his early education from his hometown and then enrolled in Cadet College in Hasanabdal, district of Punjab province and later on the Cadet College, Kohat. After having acquired the degree in medicine, he decided to specialize in psychiatry. Dr Farooq did his specialization in psychiatry from Austria. On his return he established his private practice in Sheikh Maltoon Town in Mardan city Where he was treating patient with psychiatric ailment. In 1986, he moved from Swabi to Mardan to start his clinic along with his wife, Dr Ridwana, who was a gynecologist. He had previously served in the government as a doctor. Dr Khan was known as a writer, columnist, religious scholar and Vice-Chancellor of the Islamic University in Swat. The government appointed Dr Khan as the first VC of Swat Islamic University after it decided to establish a higher educational institution in Iman Dherai, which was previously TTP headquarter. The Swat University established to replace the Madassa which had previously served as the head quarter of TTP. This Madrassa previously was owned by Maulana Fazlullah. Dr Khan was reported to have also curriculum for the University. He wrote many books to educate the clear manifestations of Islam and to eradicate the misconceptions from the Pakistani society. He also wrote a Tafseer of the holy Quran and frequently delivered lectures against terrorism. He spoke out fearlessly against militancy and suicide bombings and in the process earned many enemies. Dr Farooq wrote a book that says “Not Jihad but Qital” (Murder), where he termed the Current Killing of Innocent People in Afghanistan, Pakistan or USA like 9/11 as murder and not Jihad. Some of his works include “Pakistan and the Twenty First Century (Urdu)”, “The Struggle for Islamic Revolution”, and “What is Islam”. He loudly talked about the music and dogs and declared they are not Haram to keep in the house. As some religious Ulemma say this is Haram to keep this kind of thing in the Muslims house. His outspokenness in many issues related to religious and politics made him a dear media personality in the period of last decade. In order to help people to attain good life according to instructions of Quran and Sunnah he engaged himself in different kinds of projects related to media. He frequently took part in television talk shows in which he used to criticize Taliban and termed suicide attacks as un-Islamic. Before his assassination he was running a rehabilitation project named Sabawoon to de-radicalize and rehabilitate the young suicide bombers detained during the military operations code named Rah-e-Rast in Swat in May 2009. At least 175 suicide bombers were trained by Taliban; he was having a centre catered for them to educate them about the true values of Islam. Regarding his political career, Dr Muhammad Farooq served as a Shura member of Jamaat-e-Islami (JI) for some time, and contested the National Assembly elections as a candidate of the Jamaat Islamic Front (a political alliance led by JI ameer Qazi Hussain Ahmed) in 1993. He was jailed countless time as student leader of Jamiat Tulab-e-Islam ( a student wing of JI). He parted ways from JI saying its politics is not beneficial to Islam and it propagation. As a writer he wrote more than nine books on different issues including politics, Islam and the concept of Jihad. He also remained a member of Imran Khan’s Pakistan Tehrik-i-Insaf (PTI) for some time and held an important position in the party. Subsequently, he stayed away from politics and focused on his literary work. Dr Farooq was as a blatant critic of Taliban ideology and rejected suicide attacks as un-Islamic at a time when various leaders of the religious parties and religious scholars were hesitant of speaking against un-Islamic practices of Taliban. To carry out his mission he wrote dozens of books. During the past few years, he had been doing religious programmes on the PTV and other private channels in his bid to spread the light of education in order to enlighten people with the true values of religion. He was assassinated on 2 October 2010 while present in his clinic in Mardan district of Khyber Pakhtunkhwa Province (KP). Dr. Farooq Khan from Pakistan, a true guardian of Islam and a champion of peace. He was our brother, colleague and friend in the fight against extremism and its vicious by product, terrorism. After Dr. Farooq’s death, one cannot say that Muslims are silent about extremism and terrorism. Dr Muhammad Farouk Khan was an inspirational figure in Pakistan. My first and only meeting meeting with him was at the 1st Strategic Workshop on Rehabilitation and De-radicalization of Militants and Extremists at Peshawar, Pakistan. Dr. Farouk presented an overview of the “Sabawoon” project. A very noble project which he headed to rehabilitate captured young suicide bombers and reintegrate them to society as useful citizens. From that presentation alone, i could sense his high commitment and passion towards helping those who have gone astray. He understood the issues and obstacles facing Pakistan very well. As a religious scholar, he was determined to correct the misperception of militant and extremist ideologies. He was not only the champion of Islam but also a champion for humanity and universal peace. His untimely death is definitely a great loss to the people of Pakistan. Upon hearing the news of the assasination of Dr Farooq Khan, i was struck with shock and confusion. In my hope to rekindle those limited memories i had with such a courageous and an enlightened man, i was able to gather two significant items that reflect this astonishing individual. Firstly, a book that he authored that he had given me as a gift entitled “War and Jihad in Islam” published in April 2010 by the Awareness for Moderation Publisher in Mardan, Pakistan. His argument in the book to highlight the misinterpretation of Jihad by extremists such as Bin Laden and others was precise, filled with knowledge and wisdom, and uniquely showed a man who understood the context of time and place in applying such principles. Secondly, in my only meeting with him, i was filled with respect for him as a unique individual who was filled with an urgency, courage and a strong belief in not only wanting to change but a man who is changing the fate of his nation, his people and his faith. Dr Farooq believed that “deeds are fruits, words are leaves”. In his short life span, Dr Farooq had an accomplished life. He was an Islamic Scholar and was vice chancellor of the SWAT Islamic University. Professionally, he was a psychiatrist and former member of the Jamaat-i-Islami. He had authored several books in English and Urdu, denounced suicide bombings as un-Islamic, spoke his mind in television talk shows and remained unruffled despite threats to his life. His work in the Sabawoon project has helped numerous young Pakistanis who were indoctrinated by extremist ideologies to be given a new breath of life filled with promise and hope. It is ironical that a man who stood for moderation and had sacrificed his time, thoughts and efforts to assist young Pakistanis out of the clutches of suicide terrorism and ideological mishap fell victim by the acts of that which he was strongly opposing. In a nation where the extremists have succeeded to install fear, Dr Farooq’s fearless in upholding truth should be the spirit that CT works in Pakistan should be moulded upon. His assasination should not deter more to challenge the wayward ideas of extremism, but should be the rekindling spirit that will admonish radicalism from the clutches of Pakistan and its people. His sense of urgency should be the enlightening spirit that will benefit Pakistan and its people in winning this was of ideas. I first met Dr Farooq Khan in Peshawar at the workshop on Rehabilitation & Deradicalisation in May 2010. He struck me as a deeply intellectual and grassroots man. A kind man who felt passionately for his people, and i believe that this is evidenced in his work at the grassroots level in Sabawoon. Dr Farooq was indigenous in his presentation, wisdom and practice, with a deep desire to understand the pain and suffering of his people. He had an ability to see events as they were and responding with wisdom. When i heard that he was killed i felt that it is indeed a very sad day for Pakistan and the Islamic world. I hope that those left behind would be able to carry on his legacy in his spirit with self reflection, honesty and deep compassion for the people. May Allah whom you believe in render you reward, for you did his work among us. This impressive, deeply Islamic, unassumingly scholarly, captivatingly audience friendly personality in the person of the late Dr Farooq Khan whom i met in Khyberpaktunkwa in May 2012, made a lasting impact on me. I left Peshawar with hope for Pakistan. His callous assasination by the ruthless foces that have led a world so beautiful into chaos and wanton destruction; has pushed Pakistan into further entrenched and beleaguered situation. The senseless murder of Farooq is a great loss to the world of Islam that desperately wants Salaam and not killing of their own brothers and sisters because they hold a different view. Farooq was so gopeful for the return of democracy to Khyberpaktunkwa and Pakistan which he believed to be Koranic and Sharia friendly. His loss was not just the loss of a great friend to Pakistan, but the loss of a great peace loving compassionate thinker to South Asia. Farooq, scholar brother, may your spirit guide the next generation of young people, that you formed to persue peace incessantly and not just wish peace to one another. Your undiminishing valor and courage will continue to sustain those who came into contact with you. May Allah whom you believe in render you reward, for you did his work among us.